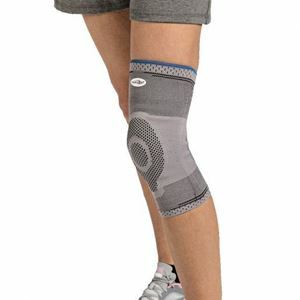 GENUFORCE (KNEEE SUPPORT) | Genu Force a new knee brace helps in keeping the pain away while you play your game. Genu Force a new knee brace helps in keeping the pain away while you play your game. The GenuForce Knee Support is designed using German Engineering and knitting technology. The knitting technology provides an elastic knitted support to the knee with better compression. 1=XS 14 1/2 - 15 3/4" 9 3/4 - 11"
2=S 15 3/4 - 17" 11 - 11 3/4"
3=M 17 - 18" 11 3/4 - 13 1/2"
4=L 18 - 19 1/4" 13 1/2 - 14 1/2"
5=XL 19 1/4 - 20 1/2" 14 1/2 - 15 3/4"
6=XXL 20 1/2 - 21 3/4" 15 3/4 - 17"
7=XXXL 21 3/4 - 22 3/4" 17 - 18"